Hi! I'm Erikia and I'm the manager here at Fancy Tiger. When I first got into sewing years ago, quilting was one of my loves. I'm a make-it-up as I go kinda crafter and don't like following patterns, so quilting came easy to me. That's not to say all of my quilts have been perfect. I've learned a lot over the years and even learned a new technique with this quilt, but more on that later. 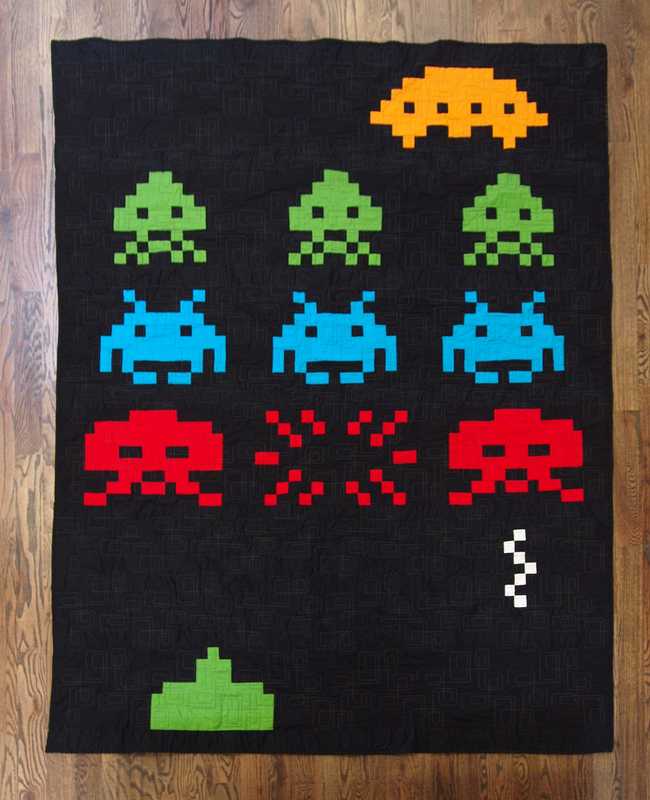 I made this quilt for my boyfriend because he needed a better blanket for his sofa. 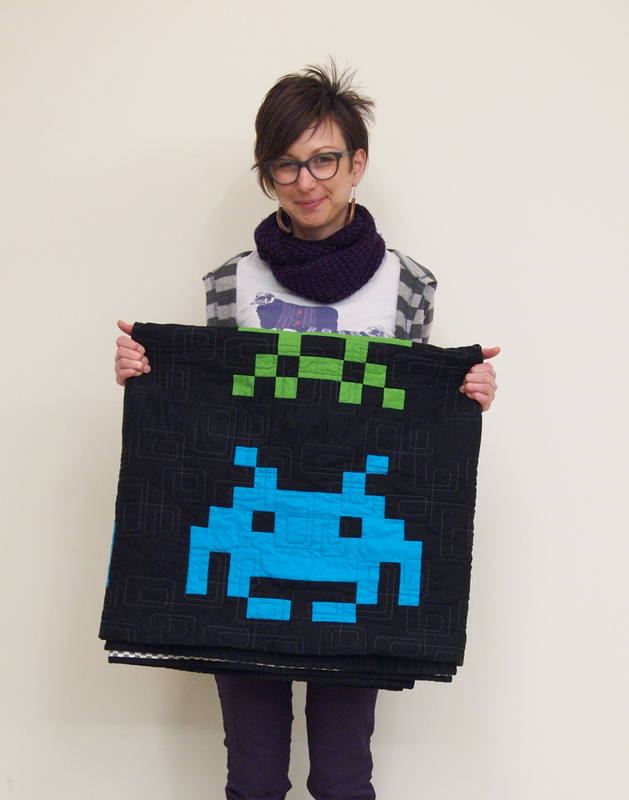 I wanted it to be uber cool, so I went on a search for edgy, modern quilts a la Boo Davis. When I came across some Space Invader designs, I knew I found the perfect pattern. 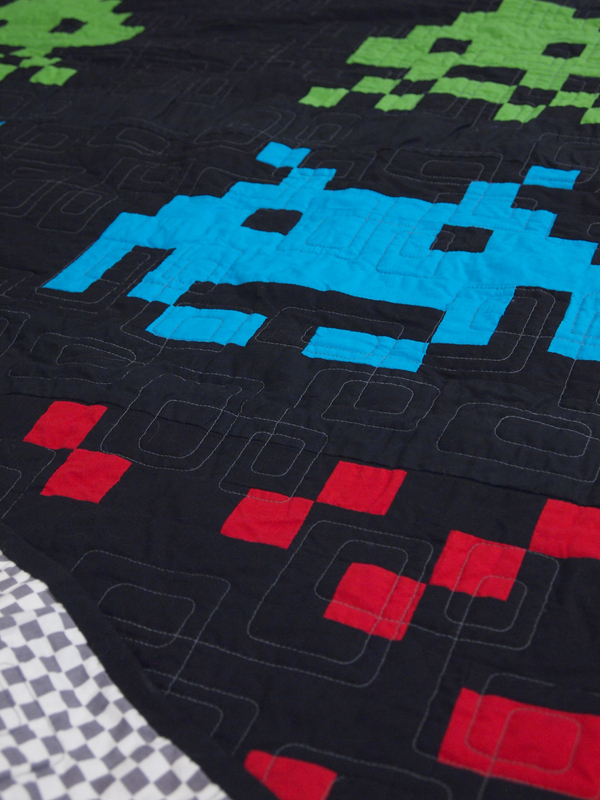 I started the quilt with a sketch based on some pixelated graphics of the aliens and went from there. I used a combination of 2x2 squares and strips with 1/4" seam allowance for the construction. Because the pattern is so graphic and the pieces were small, I wanted all my corners to lineup perfectly. I used a technique that I learned about in Tula Pink's book Quilts From The House of Tula Pink, where you nest your seams together. It worked like magic to keep the corners neat! That came out spectacularly! And the quilting pattern works so well, nicely done. Such good work! The colors are especially fantastic. It turned out so so well! AWESOME WORK LADY!